Gretchen Woodman moved to the Bulkley Valley in 2001. She worked for the BC Public Service for 14 years in the Ministry of Children and Family Development as a frontline social worker and team leader. In 2011, at the invitation of the Wet’suwet’en Hereditary Chiefs, Gretchen accepted a secondment to the Office of the Wet’suwet’en to assist with the planning and implementation of the Wet’suwet’en holistic wellness initiative founded upon distinct cultural ways of being and knowing. In 2015 Gretchen resigned from the Public Service so that she could continue working for the Wet’suwet’en Hereditary Chiefs. Gretchen’s educational background includes undergraduate degrees in psychology and social work, and a Masters of Arts (Conflict Analysis and Management). Gretchen has served on the SCSA Board since 2012 and this is her first year as Board Chair. Gretchen is mother to two amazing teenagers and her hobbies include gardening, playing the piano, spending time with her dogs and knitting. Elizabeth came to Smithers in 1987 and has never looked back. 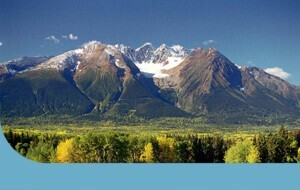 She enjoys both the amenities and the outdoor activities that Smithers and the surrounding area have to offer. Elizabeth has spent most of her career working for the provincial government in the natural resource ministries. Elizabeth has also served in various volunteer capacities over the years. She currently volunteers with the Smithers Public Library, the Bulkley Valley Backpackers Society and the Smithers Second Sheet of Ice Committee. Elizabeth has a strong interest in community services and appreciates the opportunity to serve on the Smithers Community Services Association Board of Directors. Greg grew up in Saskatchewan where he attended the University of Saskatchewan in Saskatoon and received his Bachelor of Commerce Degree in 1991. He articled for a Chartered Accountant firm for 3 years and then decided that the Public Accounting Practice life was not for him. He started with the Saskatchewan Credit Union system in November 1994, and held progressively more senior positions within Credit Unions in Saskatchewan. In October 2008 he moved to Burns Lake BC to manage the Lakes District Branch of Bulkley Valley Credit Union. In November 2009 Bulkley Valley Credit Union offered Greg the Branch Manager position for the Smithers Branch. Greg enjoys time with his wife Michelle and their four children. Greg spends his free time officiating hockey in the winter, fishing, skiing, camping and hunting. Greg is a very community oriented person that likes to be involved and help make the community he lives in and even better place to live. He currently also serves as Vice President on the board of the Smithers District Chamber of Commerce. Ken moved to Smithers in 1996 for work, and has no plans of living anywhere else. He still works at the same job with the Provincial Government, and is active in volunteer work with several groups, including the Smithers Public Library and the Smithers Squash Club. Ken is also currently President of the CICK Community Radio Board. Ken became much more aware of all the services the SCSA provides when he ran for Town Council in 2011. He decided to get involved with the SCSA Board after he was asked to join by one of the current Board members, as he thought it would be interesting to do something he had never been involved with before. Ken is in his first term as an SCSA Board member. Aaron Trowbridge was born and raised in the Bulkley Valley. While appreciative of the many wonderful communities in BC, the landscape and people of this region make it an easy choice as home to raise family. Aaron has a work background in applied soil and forest ecology, log home construction and avalanche control. His current career is in the BC public service within the Ministry of Aboriginal Relations and Reconciliation. Volunteer experience includes being the founding president of the Bulkley Backcountry Ski Society and a Smithers municipal councilor. His personal pursuits mirror this history: exploring the physical and cultural intersections within forest, mountain, ocean, lake and river environments of the Pacific Northwest. Aaron is thrilled to be able to be part of Smithers Community Services Association contributions to the health of local communities, families and individuals. Kate grew up in a log house in rural southern BC. She has also lived in Prince George, Victoria, and is now a recent addition to Smithers. Kate has worked and volunteered with community-based organizations in Canada, Nepal, Mexico, and Ghana, and has had the opportunity to be engaged in many different philanthropic initiatives, mostly involving children and youth. Her interactions with various communities and peoples, during her work and travels, have shown her the benefits supporting an individual’s and community’s capacity to affect positive change. Currently, Kate works with the Ministry of Aboriginal Relations and Reconciliation. She is excited to be living in the beautiful Bulkley Valley and is grateful for the opportunity to be part of the Smithers Community Services Association. If you are interested in becoming a Board Member please contact Smithers Community Services for more information.